Rav Yisrael Rosen, the head of the Tzomet Insititute - a wonderful organization of Rabbis doing great work - has said that someone who does not return a phone call is deservant of death from Heaven. The background is that during the days of Sefirat Ha'Omer, when we mourn the students of Rabbi Akiva who died because they did not treat each other with proper respect, this is a lesson we need to elarn. If someone leaves a message on your answering machine and you do not return the call, especially when you said "Leave a message after the beep! ", you are treating them with a lack of respect, and we see from the story of Rabbi Akiva that the punishment for this is death from Heaven. Rabbi Rosen also equates this with responding to sms and to emails, and even says anonymous emails (and I guess comments on blogs) should be responded too as well. Rabbi Rosen points out the absurdity of the situation that nowadays, when forms of communication have become so abundant and easy, is when we have growing estrangement between people. It looks like I have to figure out how to disable the voicemail on my phone! 1. The root of most of the problems before which Israel stands, is the loss of the Jewish identity... the challenge is to formulate a program of learning that obligates learning the core issues of Zionism so that every student will know why we are here and recognize the basic possessions of the Jewish Nation. 2. I think all students should also visit Judea and Samaria [and not just Jerusalem as EM Saar suggests]. Jerusalem is found in the national consensus. It is worthwhile for students to visit areas that are under debate, and by doing so will foster a love of the whole Land of Israel. Especially interesting is that these quotes (and others from other Likud MKs) are coming out of the Likud, and not just the more radical right wing parties. The Likud is going back to its roots. Organization for Quality Government responds.. If you remember the interview with MK Zoabi in which she made statements showing herself to be openly hostile to Israel, you might be interested to know that I have tried to do a bit of follow-up on the issue. I filed a complaint with the Organization for Quality Government about how she can be allowed to serve as MK in Israel considering things she had said. בשלב זה פנייתך נבדקת ע"י המחלקה לפניות הציבור, לשם קביעה האם היא נופלת בגדר הנושאים בהם התנועה מטפלת, אנו נודיעך בהמשך האם נוכל לפעול בנושא. חשוב לציין כי בדיקה זו אורכת כחודש ימים, מתוך רצון להקדיש את מלוא תשומת הלב לכל פניה ופניה המגיעה למשרדי התנועה. במידה ועולה במהלך חודש זה מידע חדש ו/או מעודכן יותר מזה שנשלח, ניתן לשלוח אותו למשרדי התנועה ולבקש לצרפו לתיק. מענה לשאלות בנושא הפניה, במהלך חודש זה, יינתן בטלפון 02-5000073 בימי ראשון עד חמישי במשרדי התנועה בירושלים (יש לבקש לדבר עם רכז/ת פניות הציבור), בפנייתך יש לציין את מס' התיק. אנו מודים לך שמצאת בתנועה כתובת ראויה לפנייתך. Basically it says they have received the complaint and will look into it. It can take up to a month. Something I noticed, but don't understand how it came to be, is that in this years batch of media articles and pictures of Neturei Karta protests against the State of Israel, they were all about the group of Neturei Karta from Bet Shemesh (don't worry - there are still less than 100 including all their kids). It used to be that they were centered in Jerusalem - Meah She'arim - and had smaller enclaves in other areas such as Bet Shemesh. Now it seems Bet Shemesh must have somehow become their main enclave. I have no intention to link to any of those articles, to show any of their pictures or to relate to their protests in any way. And on that note, I will share with you a story I heard recently about the Neturei Karta. Supposedly, if it is true, the Brisker Rav was talking with Rav Amram Blau, the head of NK, about a protest against the State for something or other. The Brisker Rav supposedly asked Blau if he would have (or maybe if he did) hel such protests against the government in Russia. Blau said no, as they would have been shot dead. The Brisker Rav said that makes you a Zionist - you only protest in Israel because you are confident in the police's ability and gaurantee to guard over you. So you rely on their protection, and their freedom to protest, to protest. You are really a Zionist. I suspect there are a lot of people who will identify with what I write in this post. Despite that, I only speak for myself, as I will describe my own conundrum. Yom Ha'atzmaut is a day of doubt and uncertainty for me. I do not mean "what do I think of the State?". I mean how do I celebrate that. By nature I am a very patriotic person. I love Eretz Yisrael and I live Medinat Yisrael. I sometimes do not like things any specific government might do, and think they are going against the values I think should be promoted, but as a State, I love Israel. We might forget 61 years later, but the State was founded with the goal of creating a homeland for the Jewish people. Nobody wanted us back then. Now we look back and say we could have lived anywhere. But when we say that, we are saying with the perspective and history of 61 years that would be completely different if not for the State of Israel. The State gave us the ability to live as Jews in our own country, and it also gave us the ability to live as Jews in other countries. Ask any holocaust survivor, ask anybody who was around at the formation of the State and they will describe to you how everything was different, in western countries, after the State was founded. Nowadays we have the freedom and forgetfulness to gripe about how bad the State is while ignoring the fact that it is only because we have a State that we have the ability to live as Jews freely. Yes, even in the United States. So what is my doubt and uncertainty? I live in and am part of the greater haredi world. For all intents and purposes, in the range of haredi, I fall somewhere within. Maybe in a specific niche of mixed ideas and beliefs - mixed with more open-mindness than the average haredi, more liberalism, more zionism, more independence, etc. But I am part of the general haredi world. As I said, I am a patriot. I love Israel. On Yom Ha'atzmaut I feel the pride and the patriotism bursting out, just as I feel the sorrow on Yom Ha'Zikaron, and just as I feel the weight of history on Yom Ha'Shoah. Yet because I am part of the general haredi world, that sense of pride has to be suppressed to a certain extent - more than I would like. If not, then there would be repercussions. It is my decision to be part of that world, and therefore my own fault, to a certain extent, but I do not think I am in a unique situation. What is one to do? I feel the pride, but I am not allowed to celebrate. Even worse is that I do not know why. Other than a few platitudes about how the State is secular, I have no idea why the rabbonim are, at best, so ambiguous, or perhaps "ambivalent" is more accurate, to the State and Independence Day. I am not claiming the rabbonim should declare us all to say hallel. That does not interest me. That is a purely halachic debate, and I am fine with whichever side you put yourself on. If you feel it is halachicly right to say hallel, say it. If not, don't say it. I can accept both opinions. I am talking about the general celebrating of the occasion. One can not say hallel, but still wave the flag and be joyous about the momentous occasion. So why don't we, in the general haredi world? Why are we afraid that if we wave the flag we will be ostracized? Why will we be ostracized if we wave the flag? The rabbonim and shuls all plan programs for the day of Yom Ha'Atzmaut. Programs of learning Torah for men who are normally at work but have the day off. It is great to be able to spend part of the day in the beis medrash learning. They plan special shiurim usually - perhaps even on interesting topics. But do they ever plan a shiur on the topic of Yom Ha'atzmaut? Do they ever explain to us that it is ok to celebrate somehow, or if it is not ok why it is not ok? All I know is that it is not accepted, but I have no idea why. The mere existence of the State has given our nation so much, that I have no understanding of why it is wrong to celebrate it. It seems that if the special shiur was on the topic of Yom Haatzmaut (either explaining why it is right or wrong to celebrate), aside from the fact that that beis medrash hosting such a shiur would likely be packed that day because so many people want to hear a torahdikke discussion on the inyan, many people would know how to approach the day properly - with direction from their rav via the shiur. the way it is, people want to celebrate somehow, think they cannot, don't know why, and have nobody to turn to. They think that if they ask then they will look too much like a Zionist and their kids will be thrown out of school, they will be chased out of the neighborhood/community, or just thought of as being too modern. Why can we not get guidance on this? Who is the true Zionist? The most surprising thing I read in this past weeks Mishpacha newspaper, was an editorial column by Yerucham Landsman. The actual content of what he said is less important, and I do not want to debate whether the specific point he made is correct or not correct. What I find more important was the simple fact that such a column ran in a haredi newspaper. The column, entitled, "Who is really best serving the concept upon which the Jewish State was founded?" goes on to argue about how the haredim are the real Zionists. The purpose of the State, as it was delineated in its early days, was to provide a home for the Jews, as they have no other home. A place where the continuance of the Jewish People would be "guaranteed". He goes on to argue (I am presenting his argument very briefly because my point is not to debate his points) that the Haredim really ensure the continuity of the Jewish State more than anyone else, as they have more kids, the kids are encouraged to stay in Israel and travel abroad much less, etc. The army, the government, the public community, institutions, etc. are all mediums for the functioning of the State. the State itself is for the continuity of the Jewish people. So haredim are really the ones who are most Zionist as they are the ones who are really best fulfilling the function of the State. The fact that in the days before Yom Ha'atzmaut a haredi paper will run an article arguing the point that haredim are more Zionist than the secular, is mind blowing. Just the essence of the existence of the debate is an indication of the shifts in the haredi world. Debating who is more Zionist? A short while ago there never would have been such a discussion at all! A common occurrence in any area with a haredi population is the removal of flags from cars. For some reason, some feel the need, and perhaps have some insecurity, to remove other peoples displays of patriotism. In RBS we have such people, mostly in RBS B. Aside from their pwn personal protests they hold every year including flying of the PA flag, black flags, sitting in sackcloth, etc. they also will rip flags off of cars. Readers have written to me about a group of thugs from RBS B who were stopping cars on the street last night and breaking flags off. one particular reader mentioned something even more troubling - firsthand testimony. last night there were about 100 people (including lots of kids) ripping flags off of private cars (and at least one Egged bus that I witnessed), on Hayarden near Ribal. I was driving from RBS towards Bet Shemesh and stopped two police vans that I saw there which were driving around aimlessly, and asked if they were planning to go over there and stop them. They both said yes, don't worry and I followed them each separately as they drove back up Mapilei Egoz. The first one drove up to the circle near the non-mall and made a U-turn straight back where he came from. The second one drove on ahead of me at three kph in the right lane, I slowed to a crawl right behind him. When he saw I wasn't passing him, he pulled over, and I did the same right behind him. After a few minutes, he drove off and then I watched him drive until the circle with the non-mall, around the traffic circle and make the left towards Ezra V'Achva AWAY from where this was happening. I made the right and drove back up to RBS-A and there were still no police. Was this a directive that they received? It seems hard to believe that it wasn't. Why are the police avoiding dealing with these thugs who are endangering the community and themselves (playing in traffic), destroying personal property, destroying the State flag, etc? Perhaps they were simply undermanned and did not want to enter the hornets nest with just two vans? So how come they did not bring backup? Have they been told to avoid conflict with the local biryonim in RBS B? It is possible, as has been suggested from other similar incidents in the past where the police also did not step in when they should have. Why do the police let this go on? The mayor has said in the past that he will stop such incidents with a heavy hand - is it all just talk to placate people, with nothing behind the words? I don't know who Eliezer Hayon is or what his background is, but he writes an article in Ynet about why Haredim do not commemorate Yom HaZikaron - Memorial Day, and Yom Ha'Atzmaut - Independence Day. He posits that it is not because they are anti this or that or have special reasons why these days are wrong to celebrate. It is as simple as not being interested. The day is meaningless to them. It is meaningless because they do not fight in the army, so the issue of Memorial Day, for the most part, does not affect them. They do not take part in governance - at best as they say they are part of government just to get for the community the resources they need, but not to actually participate in governance. It just is not relevant to them. I think there is a lot of truth in what he says, even if it is not 100% correct. Personally, I am not a big fan of the siren. I don't see its point or purpose. Of course when I am found anywhere outside of my own home I will stand in silence, and think about the soldiers. But when I am sitting in my living room or at my dining room table, I see no purpose in standing up. Even if it is just to show solidarity, I see no purpose in doing this at home where nobody sees my solidarity. So I stand up everywhere, except in the privacy of my own home. My kids get excited by anything out of the ordinary. Naturally, the siren also excites them. On the one hand they get to look like troublemakers by standing (as they are in regular haredi schools, so standing is not something they are supposed to do in school) which is always exciting, on the other hand if they make a ruckus in public, they also get to look like troublemakers. For some reason, they like looking like troublemakers. So right before the siren, while we are eating inner, the kids go outside on the porch. I thought it was ok at first, as perhaps they wanted to see cars stopping for the siren, and if outside they should be respectful. They started (before the siren) to make a ruckus, calling out to people about the siren. I immediately brought them in. I told them that I don't feel a need to stand in the privacy of my own home. If they want to stand that is fine, if they don't want to stand that is fine (inside). However, even if they do not stand in silence (inside), they have to be respectful. No making fun of anybody, no laughing about it, nothing disrespectful. Whether you stand or not, people lost relatives - sons, parents, siblings - people died defending the Jewish people and Eretz Yisrael and they deserve our utmost respect. Stand or not, but be respectful. I had to take a watch to be repaired. It needed some quality workmanship so we did not just want to walk into any jeweler for this. The place I usually use, somewhere near work, recently closed down. So I asked for recommendations and decided where I would go. We head out to our choice. This is a jeweler we never would have gone to - his shop is in a different neighborhood and I just would never have even known about him. We take in the watch, and the shop is very busy. the father, who fixes the watches, was out, and we chose to wait for him. After a while we step outside and my wife looks in the window. To her surprise she sees a bracelet that she recognizes as being very similar to one owned by a relative that recently had it stolen from them! We let the relative know - they had some very specific simanim on the bracelet as they had made some changes to the original bracelet. They go down there and see the bracelet and inspect it. Sure enough it is their bracelet. Obviously the store did not steal the bracelet. Someone else probably did and sold it to the jeweler (selling old jewelery for the gold value is very common nowadays in Israel). The jeweler placed it on display in the window, and we spotted it. So, we took a recommendation for a jeweler we would never have gone to, spotted our relatives stolen bracelet and now they are in the process of retrieving it via the police and insurance company. And for added measure, that jeweler was not able to fix the watch we had brought in - we ended up taking it to someone else who did fix it. The only reason we were sent to this place was to find that bracelet. What do you think? Pure coincidence or hashgacha? If hashgacha, as I think, why would Hashem get so involved in helping us find a stolen bracelet - for what purpose? Just to retrieve it? I don't know if this counts as music and song, so I do not know if it is a problem with sefiras ha'omer or with kol isha, but it is an Arab woman singing about blowing herself up and her daughter following in her footsteps. The committee dealing with the issue of avreichim marrying off their kids without going into debt by spending way too much money on apartments has been making progress. 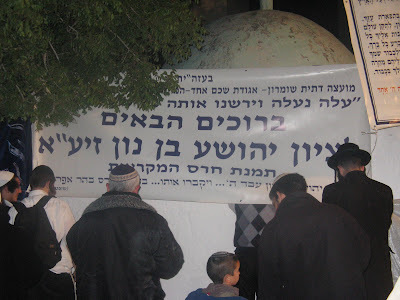 Under the direction of Rav Silman from Bnei Brak, they have worked out terms for avreichim to sign on - they will not spend more than $25000 for marrying off a son and no more than $45000 for marrying off a daughter. In a recent development, the committee has come up with a new plan. The new plan is to set up a fund via which Jewish philanthropists from abroad will pay for "the rest" of the expenses, for any avreich who signs and commits to sticking to the limitation of the committee- the $25000 and $45000 respectively. It kind of makes sense. If anyway the way the parents pay for the wedding is by traveling around the world knocking on doors to raise money to cover the loans they took out to pay for the weddings and apartments, and anyway donors from all over the world (combination of the $5 at the door to the gvir giving thousands) are covering that debt by donating to the parents knocking on their doors, there really is no reason to go through the middle stages. I mean, why force them to travel and knock on doors? If they need the money, and the donors are going to give, this just cuts out the bother and expense of travel and fundraising. Now that they said they will pay less, they will still get the funding but without the bother. Problem solved. I have read articles by and about Alan Veingrad, but here is a video about him with an interview.. There was an interesting article in the Mishpacha newspaper this week. 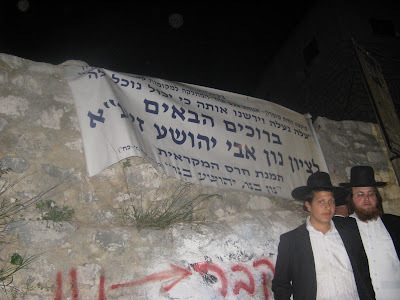 It was about the grave site of Rav Ashi (a tanna from the Talmud Bavli) and his son Mar bar Rav Ashi. The grave is located in southern Lebanon, just beyond the Israeli-Lebanon border. I had heard in the past about Breslavers who used to sneak into Lebanon to go to daven at the grave. I had not heard about it in a long time, so I thought they no longer could because of tighter security at the border, perhaps because of the recent war. I was not really familiar with how it worked though - how they snuck in and exactly where it was. 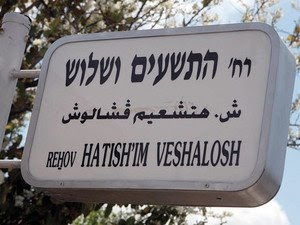 Last week I saw somewhere on the internet - perhaps Bechadrey, perhaps Ladaat, perhaps Ynet (I don't remember) that some yeshiva boys (did not say Breslav, but I think it is safe to assume they were) were stopped/arrested when trying to sneak into the grave of Rav Ashi in South Lebanon. interesting. This week, the Mishpacha ran the story of how they do this, and what happened with these yeshiva boys. I found it fascinating. They are not really sneaking into Lebanon (at least these boys did not - what they did in previous incidents I do not know). Basically there is a series of fences, and they were able to get through or around all of them until the last one. the last fence is just a couple of inches away from the grave, so standing at that fence is really being right at the grave. It seems these boys at least knew not to touch the fence or reach in and touch the grave. They were quoted as saying they knew not to as that would start an international incident. I am not sure how they knew that, but did not know they should not be sneaking through the 2 or 3 fences they passed until that point, when they later claimed they did nothing wrong and did not touch the fence and did not know they were not supposed to be there, etc. The 3 fences up to that point should have given it away that they should not be there....and I am assuming there were signs on the fence to not pass (but that could be a mistaken assumption). Anyways, the whole story and description was interesting. One point though struck me. After the boys were caught, the article quotes the boys, one of them had an opportunity to use his cellphone. he quickly called one of the tzedaka organizations (does not say which - no free advertising I guess) and gave his credit card info and a 36NIS donation. Shortly after that, the commander told them that they have a few moments before the police would arrive and he is going to let them leave. As long as they are gone by the time the police get there, they will be free. Needless to say they left immediately (there was a bit of an argument between 2 commanders - one did not want to let them go, but the other ended up convincing him). I find it interesting that this was the boys first instinct. To call and donate tzedaka. Not to call his rebbe for a bracha or his lawyer for advice or parents, etc.. He knew the number of the tzedaka org and called them first. When swine flu makes it to its first Muslim country, or at least topples its first Muslim person, will the Arabs round the world riot about the provocation of using swine against them (obviously it will also be a zionist plot), like they did with that cartoonist a couple years back? Is the ice cream shop next? I took my sister and daughter to try out a scoop or two from the new ice cream shop in the mercaz. We went motsei shabbat at about 10:15pm and found the place heaving with American teenagers, with many of them hanging out outside, smoking and chatting noisily. They were quite a happy bunch of young teen girls and boys, making a fair bit of noise as teenagers do, and my immediate thought was "Uh-oh" there is no way that the locals are are going to put up with this. There were also some somber faced Israeli charedi men lurking around across the road muttering into their pelefones and looking very disapprovingly at the scene. Once i got inside and chatted to some of the kids i realized that a. these are local kids; b. the girls were all dressed appropriately, (though in the trendy style rather than Beis Yaacov style); c. there was no 'negiah' or inappropriate hugging kissing etc. It was just some local kids who wanted to have an ice cream on a motsei shabbat. In a couple of years my kids would probably like to do the same. This is a lot like what i used to do with my friends when i was about their age. Nice kids having some fun, hanging out and not causing any trouble. Maybe people who came earlier saw other behavior, but this is what i saw at 10.15pm. When we left, the store closed at 10:30 on the dot, and the nice staff seemed to take this closing time very seriously and turned people away with a smile and a nice word. I'm sure it won't take long for the local extremists to try to shut the store down or prevent it from opening on a Saturday night or G-d forbid, start throwing eggs at the kids. And then they will feel very righteous that they have prevented such an abomination and blatant disregard of 'tznius' in their neighborhood. I hope they don't, because it is nice for our teens to have somewhere safe and harmless to go on a motsei shabbat. There's nothing else to do round here, and the only other option is to hang out in the park, which is basically boring and puts them at risk from the infamous drug pushers. At the moment i am lucky as my kids are still young, but in a few years they will be wondering what they can do for entertainment on a motsei shabbat. We have no cinema or mall or bowling or anything interesting to do, and i would really rather that they didn't just hang out in the park all night. I would love it if they could go and have a pizza with friends, or failing that, go get an ice cream and socialize a bit. Is that really too much to ask?? Tomorrow is the Tel Aviv Marathon. It is being run as part of the festivities in honor of Tel Aviv celebrating its 100th birthday. The planning of it was pretty unprofessional, as it is scheduled for the end of April which can be brutally hot weather in Tel Aviv. It turns out that the weather is beautiful, but it could have been brutal. Because of it Tel Aviv was unable to attract the top level runners of both the world, and of Israel. Also the scheduling was problematic from a marathon schedule point of view. Something to do with the schedule of other marathons just run and that will be run soon. This one just did not fit in properly. Regardless of the real pros not participating, I will be running the 10km race. I did not train for the full marathon, and could not pull it together at the last minute. I kind of feel bad about it now. I just went down to the staging area. I had to pick up my running packet - some paperwork, my number, the GPS chip and my tshirt - so I had to go down there. It is really beautiful. the weather is great, it is right off the beach and looks like it is going to be a wonderful event. I will soak it in for the 10km, and only wish I had motivated myself to push for the full 42km. oh well. On the way back, I took a taxi back to work. the taxi driver was a bit crazy, tapping on the windows of other cars while sitting at red lights. he got upset at other drivers for their weaving and not paying attention to the road. he banged on the window of one driver who was starting to drift into our lane and then started screaming at her. After that, he was complaining about how bad these drivers are. I am confident that had he been looking at the car we were in, from a different car, he would have screamed about the driver of this taxi (himself really) as well, considering how much he was trying to squeeze in between cars, running lights at the last moment and sitting in the middle of the intersection in traffic, etc. Email of the Day (eotd) : Holy Sh*t!!! If you want to improve the quality of your house plant and garden, I have for sale 100% pure earthworm castings, the ultimate fertilizer, that I have developed on my earthworm farm. I also have earthworms for sale. It is a wonderful hobby and a great way to dispose of your organic garbage in an ecological manner. By raising earthworms you can make your own castings. It is easier than you think. So contact me at the Eretz HaKodesh Earthworm Farm. And remember, Ain Lanu Eretz Acheret. They decided, with rabbinic approval to use the secular courts to pressure Egged to provide mehadrin service to the haredi community. Rabbi Landau said the above while gauranteeing that there would be no violence, as the community would follow orders obediently by way of dialogue, and not through violence. 93 Beis Yaakov girls committed suicide.. or did they? I just read an article last night that was shocking to me. I was wondering if anybody else had heard such a thing before. NRG posted an article about the 93 Beis Yaakov girls who committed suicide rather than let the Nazi soldiers defile them. The article describes how the incident depicting gevurah, purity and tzniyus came to be known - via a letter that was somehow smuggled out of the ghetto and mailed to rabbonim in NY describing the events and requesting that this group of women/girls be davened for and remembered. The story has gone on to become famous, as articles, books, poems, liturgical prayers, conferences, etc. have been held focusing on this story. Holocaust researchers have investigated the story and come to the conclusion that it is a piece of fiction - it never happened. They base the conclusion on lack of any evidence of it ever happening, along with a number of questions they have been unable to answer that put the whole story in doubt. How did the letter get out of a closed room in a closed ghetto and end up by rabbonim in NY? How did they get hold of so much poison - enough for so many people? How did none of the survivors from the area know about such a story that happened in such a small ghetto? Why was the letter written in a Hungarian style of Yiddish, when it supposedly came out of Poland? Just the sheer number - 93 - puts the whole story in doubt. How could this have happened to such a large group and go unknown? Even from the side of the nazis it does not make sense - While in private with an individual perhaps a Nazi soldier would have raped her and broken the racial laws, but so many soldiers with such a large group of women? Such things were unheard of. The conclusion of the researchers is that this is a made up story. This shocked me. Have you heard of this before? Did it really not happen? Tomorrow is going to be a "Tzniyus Rally" in jerusalem. 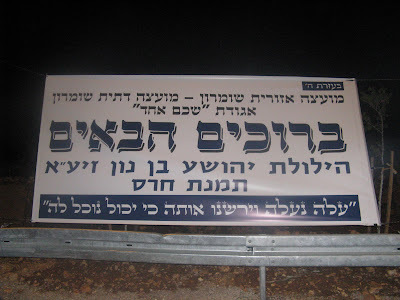 the topic is the situation of public transportation, as Rav Eluyashiv among other rabbonim will supposedly call upon the public to only use separate buses, as mixed buses are prohibited because of the lack of of tzniyus. the letter says that many of our physical problems (illnesses perhaps?) and financial problems recently obligate us to look at our actions and repent. The solution is to improve our level of tzniyus, specifically by only using separate buses, as the halacha obligates us. The rally will provide bountiful blessing upon those who come and participate. Bluke asks some good questions about this announcement and how it describes it as a halachic obligation. While our chachomim perhaps have some level of ruach hakodesh, I wonder why the problem is always tzniyus..... why not something more exciting once in a while. Mix it up with a bit of dishonesty and corruption. Maybe once in a while a touch of too much anger or gaavah. Kupat Ha'Ir is so dramatic! This is the latest tzedaka ad in the Yated for the Kupa of Bnei Brak. They are a making a "historic" trip to the grave of the Shunamit woman. 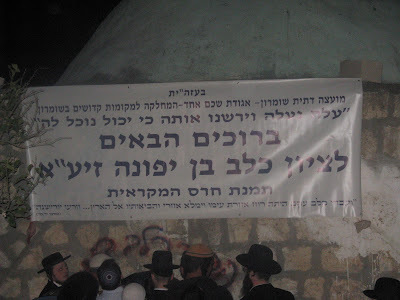 Rav Chaim Kanievsky is not joining them so it is only "with is consultation and guidance" and Rav Kanievsky will be saying tehillim and names at the same time they are at the grave. They make everything so dramatic. What is so historic about going to the grave of the Shunamit woman? It is a grave that is open to the public on a steady basis. Even if it is a place that has special power - I have heard it is specifically a segulah to daven there for children and the ad says it is as well - why is it so historic? 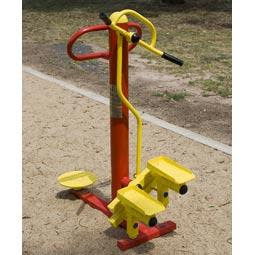 The latest trend in park equipment is outdoor gym equipment. The cities get what is basically low level workout equipment, versions of equipment you would see in a gym if you visited one (which i religiously avoid), and stick them in parks. Israel has been installing such equipment in parks all over the country over the past year. At first I thought it was strange - why would someone want to work out on equipment like that in public, waiting in line with other people, etc.? I still don't know why, but I have gotten used to it. You can drive (or walk) by many parks anywhere in Israel and see adults and kids enjoying the exercise equipment. 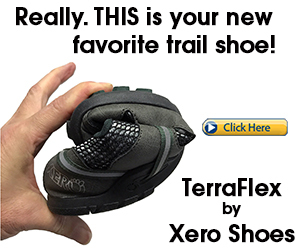 I personally have never used them, as I hate waiting in line, and the lines are always very long. I don't think my kids use them either. Anyways, on erev chag, while everyone is busy with Birkat HaChama, burning chametz and general Pesach preparations, the mayor of Bet Shemesh found it to be the opportune time to send a tractor in to one of the RBS parks and remove the gym equipment. This was done without any discussion in the City Council and with no debate or vote, and no prior announcement to the local residents. Unfortunately for the mayor, this was also done a few days after he successfully removed the equipment from the central park in RBS. Unfortunately for him because people saw what was happening and ran to stop it. A group of people literally stood in front of the tractor and would not let him pull out the equipment. After a lot of screaming, police and council members getting involved, the mayor agreed to leave the equipment in place and open a discussion after the holiday about removing it. The reason given for removing the equipment is safety. It seems a number of children have injured themselves on the equipment, someone [with connections] complained and possibly threatened a lawsuit, and the mayor reacted with a decision to remove the equipment. 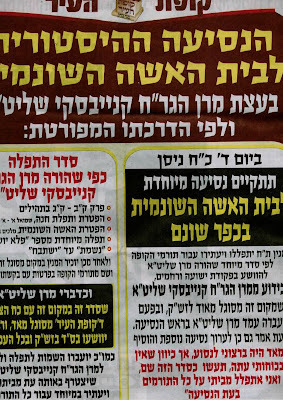 People in the know, including a number of council members including at least one from the haredi party UTJ who is unhappy with the direction things have gone, have confirmed that the real reason, perhaps in tandem with the safety issue, is that a number of local rabbonim have been pressuring Mayor Moshe Abutbol to remove the equipment. The pressure has been incessant and their reason for pressuring him to remove it is that they consider it not tzniyusdike to have the equipment in the park - perhaps one can see girls exercising, perhaps because it is boys and girls mixed in close proximity, depends who you ask you will get a different explanation of what is not tzniyusdike about it. It is very difficult to ascertain what the real reason is. It is probably a combination of the two. It is a fact that the rabbonim and a few kannoim have been pressuring Abutbol to remove the equipment, and it is a fact that a number have kids have suffered injuries on the equipment. It seems likely that the city took the opportunity of a recent injury to the child of someone "well connected" to also relieve the pressure from the rabbonim and just get rid of the equipment. Abutbol has taken the stance that it is purely a safety issue and has nothing to do with pressure form kannoim and rabbonim. So his spokeman, Mati Rosenzweig, says while comparing it to a bottle recycling crate that was unsafely installed in the neighborhood which fell on a young girl killing her a few years ago. So says his top adviser and assistant Asaf Metri. The truth is that nobody wants unsafe equipment in the park. if the equipment is unsafe, it should be made safe. I don't know that it is unsafe - it has passed all the standards requirements and is placed all over the country. there is no reason it is any more unsafe in RBS parks than it should be considered anywhere else in the country. Perhaps some adjustments need to be made. Perhaps parents should be responsible and not let their younger kids on the equipment (the equipment has signs saying that it is unsafe for kids under the age of 14). Perhaps the iryah needs to make adjustments to the equipment or to their location to make them safer. Fencing them in to a specific area was a suggestion being considered by the mayor. Distancing them from general park equipment where young kids play is another suggestion. Perhaps there are other solutions. Another point is that I know kids that have gotten injured on the regular park equipment as well. My own kid lost two teeth a number of years ago on regular park equipment. Other kids have fallen off of monkey bars and broken arms, there are slides in parks that the slide is cracked and can seriously injure sliders, kids fall off swings, kids get their heads banged as they walk under see saws, etc. It is also unusual that out of the whole country, out of the whole Bet Shemesh, the only place the equipment is being considered unsafe is in RBS. Removing the equipment "like thieves in the night" raises serious doubts whether the real reason is the safety issue (if the issue is real at all) or whether it is caving in to local extremists. All safety issues should be addressed, and removing the equipment is not the solution. On the new equipment along with the old equipment. All parks should be safe for kids. All over Bet Shemesh and all over Israel. 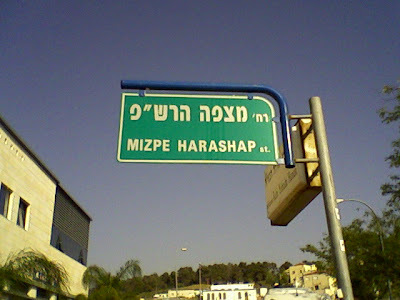 But if the issue is really the "tzivyon" of the neighborhood, I protest the removal. I have heard that tonight there will be a meeting between concerned residents and the mayor at the Matnas in RBs at 8:30pm. Anyone concerned should try to attend. Of course, be aware that attending and requesting the equipment be returned will also likely mean your kid will get thrown out of school (if he or she is in a haredi school), so I guess there is no real point to the meeting because not too many people will stand up and protest the removal. Because of that, this fight will be led by the Dati Leumi community and will then be depicted as a DL-Haredi fight, when the truth is that most local regular haredim have no problem with the equipment. Depicting it like this will then force many of the normal haredim to take sides, and they will be forced to side with removing the equipment. That is a shame. The opening ceremony commemorating, with the focus this year being on the 1.5 million children who were murdered, Yom HaShoah at Yad Vashem can be seen at the Yad Vashem website. Prime Minister Benjamin Netanyahu gave a powerful speech at the ceremony. You can read it in English in this word document from the PMO website. [...] Yurek was only 14 when the Warsaw Ghetto was established. He turned from child into adult overnight. He smuggled food into the ghetto and his life was under constant threat. Yurek survived. He immigrated to Israel, fought in the War of Independence, started a family and built a home at Kibbutz Meggido. He lost his son Eitan during the Yom Kippur War, but found the fortitude to overcome this tragedy as well. He continued living, continued building and continued inculcating his legacy into thousands of youngsters. His life story and activities are, to a large extent, a mirror of the Jewish people's transition from exile to liberty – a story of suffering, supreme heroism, construction and renaissance; a story of bereavement, faith and independence. Yurek may have survived the inferno, but close to a million and a half Jewish children did not survive and perished in the Holocaust. I think the human mind cannot grasp this fact. We always see before us the famous picture of the frightened Jewish child, raising his hands in front of the barrels of German rifles. But this child was only one out of a million and a half children, a million and a half pairs of frightened eyes. Each one of them was an entire world of hopes and dreams, a mother's love and a father's concern, a world transformed instantly into one of terror, suffering and death. Some of them survived for months and years, hiding in dungeons and forests, freezing in the snow, or starving to death. Children of ten or twelve years-old, escaping like persecuted wild animals from the Nazi hunters hunting them down in order to kill them. Some of these children found shelter in churches and convents, separated from their parents, torn by their longings, sometimes found shelter in the homes of the best of humanity, non-Jews, Righteous Gentiles who risked not only their lives, but also the lives of their families to rescue them from death. Some of the children, like Yurek, in a reversal of roles became children defending their parents. Children of eight or nine years-old who risked their lives daily to bring food into the starved ghetto and a piece of bread for mommy and daddy. Little heroes, awarded a medal by no one. The majority of them left behind them neither a name nor a trace. The Nazi beast devoured them and their parents, and there is no one to tell of their tale of heroism. However, even in moments of the most terrible despair of our people’s history, in the final moments of the Warsaw Ghetto, Jewish youngsters from all streams fought an unparalleled war of heroism against the Nazi oppressor. By doing so, they marked the great transformation that was about to occur in the fate of our people several years later, with the establishment of the State of Israel and the Israel Defense Forces. "In every generation they rise against us to destroy us; and the Holy One, blessed be He, saves us from their hand". He saves us through the living spirit in our people and its representatives – judges, prophets, kings, Maccabim. Survivors chosen to light the torches, including the twin sisters who suffered under Mengele, spoke briefly of their stories. Rav Lau spoke as well, comparing to Moshe being thrown into the Nile. Batya, the first "chasidei Umot HaOlam" saw him crying - saw rather than heard, because Jews have a natural instinct to cry silently so as not to give up those around him in hiding. And Batya knew that he was Jewish because he was crying like that. Rav Lau decribed how when they were in hiding and the Nazis were looking for them, his mother put cookies in his mouth as a child to make sure he would be quiet and not give them up. Rav Lau says he told his mother that there is no need because he knows that he must be quiet. Rav Lau says our children need to appreciate what we have here - a national house, a country, freedom, the ability to stand tall. We should kiss the ground of this land that gives us the merit and Jewish identity and full life in our own home. The ceremony concluded with the army chazzan chanting the Kel Moleh. On another note, The Jewish Week published an article by Isaac Steven Hershkopf about growing up among survivors and how they lived, concluding with a fascinating, very personal, story about Rav Moshe Feinstein. I was, of course, upset when she burst into tears and ran out of the kitchen, but I was also confused. This was Washington Heights in the 1950s. It was an enclave of survivors. Every adult I knew had a number. Even my teenage sister had one in blue ink tattooed on her forearm. They were as ubiquitous on the benches of Riverside Drive as they were on the footpaths of Fort Tryon Park. If you saw an adult with some sort of hat on his head, he invariably also hada number on his arm. In the summer, when the community traveled en masse to Catskill bungalow colonies, or to Rockaway beaches, the numbers came too. I presumed it was a ceremonious part of becoming bar mitzvah, or perhaps graduation from Breuer’s or Soloveichik, our local yeshivas. No one appeared to be embarrassed by their number. ARG! I never saw anyone try to cover it up when they went swimming. It seemed to be a matter of fact part of life. When, as children, we would ask our parents why there was a “Mother’s Day” and a “Father’s Day,” but no “Children’s Day,” the automatic response was “Every day is ‘Children’s Day’!” In Washington Heights, in the ’50s, every day was Yom HaShoah. Ironically enough, at the same time, no day was Yom HaShoah. The commemoration, as it exists today, was not around then. Breuer’s and Soloveichik consisted almost exclusively of children of survivors, yet neither school had any assembly, or recognition of any type, of the Shoah. [...] One summer I was spending a week with my aunt and uncle in upstate Ellenville. Uncle David and Aunt Saba, survivors themselves, as the doctor and nurse in charge of the concentration camp infirmary, had managed to save the lives of innumerable inmates, including my mother and sister. After “the War” they had set up a medical practice in this small Catskill village, where, I discovered, to my amazement, they had one celebrity patient — Rav Moshe. My aunt mentioned casually that Rav Moshe had an appointment the next day. Would I like to meet him? Would I? It was like asking me, would I like to meet God. We held our regular Yom HaShoah ceremony in the office commemorating the victims of the Holocaust. After the siren, some tehllim, mishnayot, and the Ke-l Maleh, we sang the famous tune Ani Maamin composed by a Modzitzer Chassin in a cattle car. Although he was centered in Otvoczk, Rebbe Shaul Yedidya Elazar of Modzitz had Chassidim throughout the major towns and cities of Poland. One of these was Reb Azriel David Fastag, who became noted for his exceptional voice throughout Warsaw. Many came to the shul where Reb Azriel David and his brothers, who were also blessed with lovely voices, would daven on the Yamim Noraim [High Holy Days]. Reb Azriel David was the ba'al tefilla [led the prayers], while his brothers accompanied him as a choir. His crisp, clear and moving voice had a profound effect on all who heard him. Dark clouds began to cover the skies of Europe - the clouds of Nazism. In spite of the terrible decrees, the yellow patch and the ghettoes, most Jews could not fathom what was about to befall them. Only a few "read the map" correctly and managed to escape the clutches of the Nazi occupation to safe havens. One of them was the Modzitzer Rebbe, Rebbe Shaul Yedidya Elazar, whose Chassidim made a tremendous effort to save him. As the Nazis entered Poland, the Chassidim smuggled him out of Poland to Vilna [Lithuania], and from there he made his way across Russia to Shanghai, China, eventually arriving in America in 1941. Meanwhile in Poland, tens of thousands of Jews were being 'shipped off' daily to their death in cattle cars that were part of the railway system. Aroused from their warm beds in Warsaw, husbands were separated from their wives, children from their parents. The elderly were often shot on the spot in front of their loved ones. Then the Jews were gathered and sent off in these trains to a place where their existence would no longer trouble those dregs of humanity known as the Nazis - to Auschwitz, Treblinka, Majdanek, etc. What did it look like in one of those cattle cars of the "death train"? What could one expect to find other than people in their death throes - gasping, sighing and crying? One could hear the stifled cries of children, crushed together and trampled upon by the spiked boots of the evil, cruel Nazis. An elderly Jew, wrapped up in his ragged clothing, his face white as snow, makes his way over to his neighbor on the death train, begging him to remind him of the niggun the Modzitzer Rebbe sang on Yom Kippur for the Avoda, to "Ma'areh Kohen." "Now - now - all you want to know about is niggunim?" answered the other, with a hard look at the Chassid, thinking that maybe all the suffering had caused him to lose his mind. But this Modzitzer Chassid, Reb Azriel David Fastag, was no longer paying attention to his friend, or to anyone else on the train. 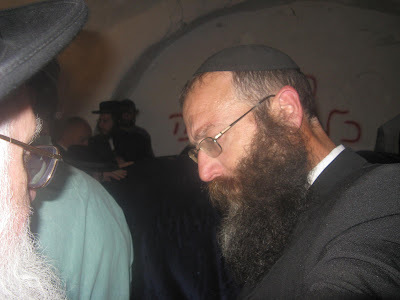 In his mind, he was at the Amud HaTefilla [prayer stand] next to the Modzitzer Rebbe, and it is he who was the baal tefilla before all the Chassidim. Suddenly, before his eyes, the words of the twelfth [of thirteen] Principle of Jewish Faith appeared: "Ani Ma'amin b'Emuna Sheleima, b'vias HaMoshiach; v'af al pi she'yismamaya, im kol zeh, achakeh lo b'chol yom she'yavo - I believe with perfect faith in the coming of the Moshiach; and even though he may tarry, nevertheless, I wait each day for his coming." Closing his eyes, he meditated on these words and thought, "Just now, when everything seems lost, is a Jew's faith put to the test." It was not long before he began to hum a quiet tune to these words. Amidst the heavy atmosphere of death and despair on the train, Reb Azriel David's dveykus [attachment to Hashem] took him above it all. "How can one of us be singing at such a time?" wondered his fellow Jews on the train. And with such a sweet voice! It must be, that from Heaven they are accompanying us, in mourning, to our death... But listen, what is it that they are singing? You're about to be slaughtered, shot, poisoned or burnt and what are they singing? -- I believe!!!" The moving tune, with its holy words, had penetrated the hearts of the Jews on the train, and had joined to the pure emuna [faith] in their hearts, which burst out from them in the form of this great song. The song spread from car to car. Every mouth that could draw a breath from those congested cattle cars, filled with live "corpses" and pungent with the odor of people crowded together, joined in a piece of "Ani Ma'amin - I believe." It became a wonderful, amazing symphony unto itself. An elderly Jew, close to his death, asked for an explanation. His neighbor screamed to him, "We're singing the Jewish People lives - chai - lives! You too, sing with us - the Jewish People lives, Ani Ma'amin!" Closing his eyes, the elderly Jew clenched his fists and sang with his remaining strength - "the Jewish People is alive, I believe that Moshiach Tzidkeinu [the Righteous] will come quickly," and expired. As the train neared the death camp, the railway workers wondered: from where is this amazing song coming? Could the Jews be singing their own burial service tune? As if waking from a dream, Reb Azriel David opened his eyes to the sight of the singing train. His eyes were red from crying; his cheeks, wet with tears. Deeply moved, he yelled to whomever would listen, "My dear brothers! This niggun is the song of the Jewish soul. It is a song of pure faith, for which thousands of years of exile and troubles cannot overcome!" Then, in a choked voice, he continued, "I will give my portion in Olam Haba [the World to Come] to whomever can take these notes of my song 'Ani Ma'amin' to the Modzitzer Rebbe!" A hushed silence descended upon the train. Reb Azriel David lifted himself up by the ends of his thumbs, searching through the crowd that surrounded him. Two young men appeared, promising to bring the notes to the Modzitzer Rebbe, at any cost. One of them climbed upon the other, and in the small crack of the train's roof that only he knew of, made a hole from which to escape. Poking his head out under the open sky, he said, "I see the blue Heavens above us, the stars are twinkling and the moon, with a fatherly face, is looking at me." "And what do you hear?" asked his companion. Turning white, the young man answered, "I hear the Ministering Angels singing the Ani Ma'amin tune, and it's ascending to the seven firmaments of Heaven..."
Bidding farewell to their brothers and sisters on the train, the two proceeded to jump off, one after the other. One was killed instantly from the fall, while the other survived, taking the notes of the song with him. He eventually found his way to Eretz Yisrael [perhaps to the Rebbe's son, the Imrei Aish, who was in Tel-Aviv], and the notes were sent by mail to Rebbe Shaul Yedidya Elazar in New York. Upon receiving the notes and having the "Ani Ma'amin" niggun sung, the Rebbe said, "When they sang 'Ani Ma'amin' on the death train, the pillars of the world were shaking. Hashem said, 'Can it be that My Torah is a fraud? No! But whenever the Jews will sing 'Ani Ma'amin', I will remember the six million victims and have mercy on the rest of My People.'" It is told that on the first Yom Kippur that the Rebbe sang the "Ani Ma'amin," there were thousands of Jews in the shul. The entire Kahal [congregation] burst into tears, which fell like water into the pool of tears and blood of the Jewish Nation. The tune soon spread throughout Klal Yisrael [world Jewry]. "With this niggun," said Rebbe Shaul Yedidya Elazar, "the Jewish People went to the gas chambers. And with this niggun, the Jews will march to greet Moshiach." David Brooks, in his NY Times column, writes about Israel as the "Loud and Promised Land". Israel is a country held together by argument. Public culture is one long cacophony of criticism. The politicians go at each other with a fury we can’t even fathom in the U.S. At news conferences, Israeli journalists ridicule and abuse their national leaders. Subordinates in companies feel free to correct their superiors. People who move here from Britain or the States talk about going through a period of adjustment as they learn to toughen up and talk back. Ethan Bronner, The Times’s Jerusalem bureau chief, notes that Israelis don’t observe the distinction between the public and private realms. They treat strangers as if they were their brothers-in-law and feel perfectly comfortable giving them advice on how to live. One Israeli acquaintance recounts the time he was depositing money into his savings account and everybody else behind him in line got into an argument about whether he should really be putting his money somewhere else. Another friend tells of the time he called directory assistance to get a phone number for a restaurant. The operator responded, “You don’t want to eat there,” and proceeded to give him the numbers of some other restaurants she thought were better. This culture of disputatiousness does yield some essential fruits. First, it gives the country a special vividness. There is no bar on earth quite so vibrant as a bar filled with Israelis. Second, it explains the genuine national unity. Israel is the most diverse small country imaginable. Nonetheless, I may be interviewing a left-wing artist in Tel Aviv or a right-wing settler in Hebron, and I can be highly confident that they will have a few things in common: an intense sense of national mission, a hunger for emotionally significant moments, an inability to read social signals when I try to suggest that I really don’t want them to harangue me about moving here and adopting their lifestyle. Most important, this argumentative culture nurtures a sense of responsibility. The other countries in this region are more gracious, but often there is a communal unwillingness to accept responsibility for national problems. The Israelis, on the other hand, blame themselves for everything and work hard to get the most out of each person. From that wail of criticism things really do change. I come here nearly annually, and while the peace process is always the same, there is always something unrecognizable about the national scene — whether it is the structure of the political parties, the absorption of immigrants or the new engines of economic growth. A country of Jews. We each know better. 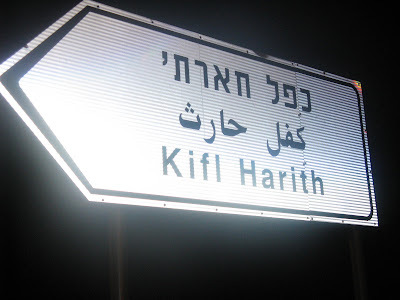 Last night was the annual entry to Kifl Harith, or by its biblical name "Timnas Heres" to celebrate the yahrtzeit of Yehoshua bin Nun and daven by his gravesite. Buried nearby is his father Nun, and Calev ben Yefuneh. The arrangements were slightly different than in the past. They changed some of the road in the immediate area, and paved the entrance to the village. So what used to be used as the staging area for the army and a parking lot for the visitors no longer exists in a usable fashion, for the most part. So the police and army with a cadre of "sadranim" direct visitors to parking nearby across the street. Another difference was the time of entry. I remember in the past it was open from 12 until about 5 or so. This time they opened up relatively early - they scheduled entry from 10pm. The actual entry was not approved until about 10:45, but it is still better than only starting at 12.
this is Google Earth on steroids. It was in the main army tent at the entrance and was an extremely detailed map of the area and village. After parking and finally being allowed in, we walked from the entrance of the village all the way to the graves, first encountering the gravesite of Calev. I saw no sign of the shuttles that were advertised. That being the first site, it was packed as everyone crammed in there right away. While in the room with the grave of Calev, in walked Baruch Marzel escorting Rav Yaakov Yosef (the son of Rav Ovadia Yosef). Later, outside the grave of Yehoshua, I saw Ichud Leumi MK Michael Ben-Ari. By Yehoshua, he is supposedly buried under the wall of the room. It is not a proper grave-headstone. So many were just davening outside. the room inside is very small and cramped. With tens of people packed in at the same time davening, the air gets very scarce. The davening was intense, and of course there was the Breslav wail every few minutes. 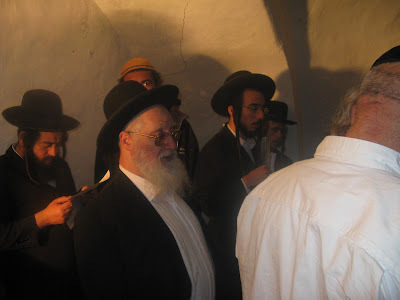 If you see a picture on other sites of Rav Yaakov Yosef in Joshua's Tomb, you might see me as well. Inside the tomb of Joshua I was standing right next to him davening as we entered at about the same time. Most of the buzz int he area was outside of Joshua's Tomb. there was a class of 5 year olds who arrived with rebbes and were dancing. I think there was an upsherin as well. The tables of refreshments were there. This was the central area. I did not see any cholent this time, but they had plenty of Yerushalmi Kugel. 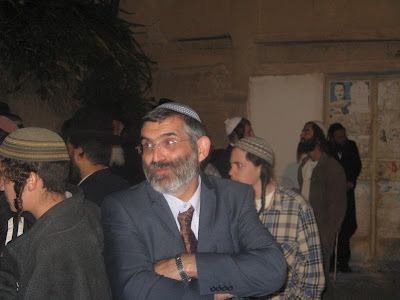 There were thousands of jews of all types, affiliations and styles who came out to daven. It seemed much busier than I remember it from the past. While I initially thought we would be in and out quickly because of the early start, I was wrong. The large crowds, the dark and the long distances to walk made it take much longer than expected. We got out at about 1am and got home a bit before 2am. needless to say, my boys slept in this morning and went to school late. By now you cannot be a regular reader of Jewish websites and blogs and not be familiar with the "strawberry infestation". They say that this year strawberries cannot be eaten, at least not whole. The reason is because of an unusual infestation. Normally the bugs in strawberries hang around and party near the top of the strawberry - in the leafy part. As long as you cut the top off, and wash the rest of course, you are good to go. This year, they say, the strawberries are infested to the point that the bug party is not just at the top by the leaf, but all over the strawberry - by the seeds in the wall of the berry - thus making it impossible to clean properly and eat (unless perhaps if you would peel the strawberry - not very practical). Why are the strawberries infested so much worse this year than normal? The only reason i have seen offered is because of the shmitta year - Jewish farmers for the most part did not grow strawberries this past year, because of shmitta. Most strawberries were grown by the Palestinians, and they use dirty water for their irrigation and watering. The use of dirty water caused the strawberries to grow, supposedly, completely infested. Personally I have always held like the opinion that if you cannot find the bugs and cannot see them with the naked eye (looking well when necessary - not just a cursory glance), they are not considered a problem. If these bugs are so tiny that you need a powerful microscope to see them, it does not seem to bother me. If we would inspect the air we breathe with a microscope and magnifying glass, we would also say it is assur to breathe because of what we are taking in. Just for kicks, I bought strawberries on Friday for shabbos. I took a couple of random berries from the bag and inspected them very closely, but only with my naked eye. I pulled out the little pips and inspected them, and under them. I inspected the whole berry very thoroughly. Yet I was unable to see any creepy crawly or clingy buggies. So what do you do about strawberries and other such fruit and veggies with "bug problems"? Have you stopped eating them? Yossi Elituv is a haredi journalist. He recently wrote an article in the Maariv newspaper about the reality television program "Survivor". 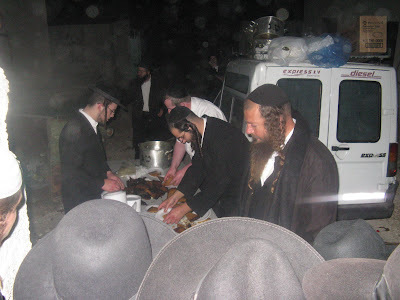 Elituv was upset that during an episode of "Survivor" broadcast during Pesach the contestants were seen eating chametz. Elituv says that it is a shame everything is done for the ratings and advertising money and nobody cares about jewish values - while if a show would display something hurtful to a foriegn culture, there would be protests [from the elite of Ramat Aviv] against the insensitivity. It is only Jewish values that the broadcasting authority feels they can trample without consideration. While Elituv does have a point, I personally feel he has no place discussing reality television and its problems. He is not a minister in government or an official of the Israel broadcasting Authority that would give his opinion possible influence to change things for the better. He is a journalist writing mostly in haredi newspapers with the occassional article in Maariv. The Haredi community has for the most part eschewed television. The haredi household that has a television is a rare breed. Elituv has no business commenting on the phenomenona of reality tv when his main readership is haredim. The only thing articles like that do is cause people to want to watch the show to see what he is talking about. So either they will be frustrated and curious, or they will put out some effort to get a hol do fthe show to watch - either on the internet, or go to the house of someone who does have a tv. Elituv is doing more harm to his public than good. Of course if he was in a position of influence and his opinion would have the chance of making a difference I would be ok with voicing his opinion. But he is not in such a position, and not every stupid thing done needs to be protested by haredim. Of course this is also in addition to the ridiculousness of his claim - Elituv is upset about chametz on Pesach. I don't think they necessarily ate chametz on Pesach - the show is not broadcast live. It was recorded earlier and only broadcast on Pesach. Also, by protesting the chamtez on pesach, is Elituv saying the chillul shabbos, the eating if bugs and crabs and non-kosher animals, the traipsing around in bikinis all day, and all other items are ok? Only chametz on pesach is enough to protest? 04/16 — The Jets have formalized their request to the NFL regarding the team's schedule, announced Tuesday night, to move the kickoff of the Jets' Sept. 27 home game against Tennessee from 4:15 p.m. to 1 p.m. to avoid conflict with the Jewish observance of Yom Kippur. The club has been in behind-the-scenes communications with the league office for the past two days. Today, Woody Johnson, the Jets chairman and CEO, sent a letter to NFL commissioner Roger Goodell. "I understand the challenges and complexities associated with creating the NFL schedule each year," Johnson said in his letter. "However, I am extremely disappointed with the League's decision to schedule us to play at home on consecutive Sundays that are in direct conflict with the Jewish High Holy Days. There has long been an understanding that neither the Jets nor the Giants fans should have to bear completely the brunt of this issue since we are in the largest Jewish market in the country." The Jets owner explained that the club feels the best solution is to change the time of the Titans game. "This would give our Jewish fans the opportunity to arrive at home before sundown for Yom Kippur," he said. "Those who suffer most are our fans," Johnson concluded. "The NFL has been the leading proponent of improving the fans' gameday experience. I feel making this change will further that goal." It does bring to mind the gemara that Hillel obligates the poor because he studied despite the great destitution, so that cannot be used as an excuse. Reb Elazar ben Charsom obligates the wealthy by his not letting his business decisions and concerns divert his attention from Torah study. Yosef HaTzaddik obligates the handsome because despite his attractivess he did not let it get in the way of his righteousness. So do the New York Jets now obligate the Jewish sports fans? "This decision harms freedom of worship, and it is actually the entrance of the rightist pyromaniacs that should be banned – not the entrance of Muslims,"
---- MK Ahmed Tibi on the decision to bar Muslims under the age of 50 from entering Temple Mount today for prayers out of fear of riots in response to calls for allowing Jews to pray on Temple Mount. I started using Superbus service for my local Beit Shemesh travel in mid-January when their tender over a number of formerly Egged routes began. It was with much trepidation that I went into their Beit Shemesh office, the day before their deadline for issuance of free "smart-cards", and was processed for a card. Why trepidation? Consider what Nadia Matar and others have said and written about institution of technical identification databases here <http://www.sefer-torah.com/blog/2006/12/19/hi-tech-id-of-yesha-jews-at-checkpoints-preparing-yehudashomron-for-yudenrein/> and here. <http://www.sefer-torah.com/blog/2008/08/03/israeli-leftist-regime-animal-farm/> In short, "smart-cards" are another sign of Animal Farm, of Big Brother, of Israeli thought police and the state's surveillance of its citizens. But *Superbus' secrecy and deception and/or failure regarding providing customers of a full accounting, upon demand, of all blocks of rides bought, paid for and posted to their "smart-cards" shows that Big Brother, i.e. 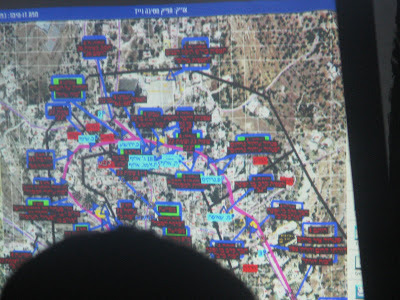 Police and Shabak surveillance of citizens is but a part of the problem. *There were/are monetary incentives to using the "smart-card", i.e. that one possessing a Teudah Zacha'ut, for example, saves 11.50 NIS per 15 ride block by purchasing Superbus rides on their "smart-card." My understanding is that for pensioners, the saving is greater yet. On the first full day of the Superbus takeover, I bought a block of local Beit Shemesh trips. After a period of time, I had run down the trips to where there were 3 or 4 left and went to buy another block. American Anglo common-sense tells me that upon buying the second block of trips, the next bus receipt would show the total number of trips remaining that had bought and paid for, i.e. 19 (New block of 15 and balance of 4 trips remaining in the first block). Not! Instead, on the next ride on Superbus, their computer terminal showed that there were but 3 rides remaining after deducting the current ride. What happened to the new block of rides which I had just purchased? I didn't know at the time that one could request a full accounting of everything on one's "smart-card." Fortunately, when the old rides were used up, the new rides kicked in. So then I ran down the rides on this block to 4 and then bought the next block, seemingly secure in the notion that the Superbus terminal would be consistent and again run down to old block of rides to zero before charging the new block of rides. Again, Not! Instead, the Superbus computer terminal began running down the new block of rides instead of the old one. At that time, I raised a fuss and the driver printed me out a full accounting of the rides remaining in both the old and new blocks. On Superbus, you place your "smart-card" on the spot on the terminal and the driver hands you back a receipt slip with your card. The problem is, that the terminal receipt only shows the how many trips are left on the block of rides being deducted from. Nowhere does it show how many total rides you have bought, paid for and have remaining. Nowhere on that receipt slip does it give a full accounting of what is still on your "smart-card." Further the *drivers have begun deceiving their passengers by prentending that they don't know what the passenger is talking about when the passenger asks for a balance statement. * They continue their deception even when the rider shows them the previous balance statement document and they claim that they don't know what the statement is called in Iv'rit. You try to ask for a cheshbon -- Not! You ask a friend who is in Israel longer than you and converses freely in Iv'rit and he tells you; Peirut (Pey, Yud, Reish, Vov, Tet) -- Not! One of the other passengers on one of the buses suggested the loshen "Duch" which I understood a long time ago to mean report. Once again -- Not! Meanwhile, one of the drivers who feigned not to know what I was talking about when I was asking for a balance statement double-charged me for the same trip. Further, Superbus drivers deceivingly keep pointing to a Superbus office in Ramat Beit Shemesh, an office which has not existed for weeks. Meanwhile, another individual who detected the same problems that I did spoke with *a Superbus supervisor* who checks to be sure everyone on a bus has paid. The supevisor *told him that we passengers have a right, on demand, to a balance statement of everything on our "smart-card." *Finally, this morning (Sunday) I visited the Superbus in Beit Shemesh. A supervisor, Avi, who greeted me with a little bit too cheery Mo'edim B'Simcha, as if patronizing and condescending toward me, commenced to tell me that the drivers don't have to help passengers in any way, i.e. with a full balance statement of the contents of a passenger's "smart-card." He tells me that when there are other customers getting on the bus,* the driver has no obligation at all to provide such a statement upon a passenger's request. What that means is apparently that the driver can refuse to give you that which you have a right to. * Further, he told me that *the driver does not have to know what a card balance statement is. *I told him that *Superbus' secretiveness and deception concerning balance statements leaves wide open the possibility of them lopping off blocks of rides from their computer* on passengers, poor passengers, mothers who travel on the bus with babies, strollers, often entering the bus piled down with groceries and just want to pay their fare and who probably lose their receipt slips most the time. If such lopping off blocks of rides on passengers, which these passengers had previously paid for but not used, were to occur, it would directly impact Superbus' bottom-line with excess, illegal, ill-gotten profits. After heated words, I told Avi that I was unsatisfied with his answers. I told him that I believe that Superbus is hiding something by their deception of customers and that I have already informed the major RBS chessed organizations of a potential serious problem impacting poor people. I did manage to get one piece of information out of Avi. I asked what the loshen is for the balance statement and he told me *"Meida (Mem Yud, Daled, Ayin) B'Cartis"* (pronounced Mayda). I strongly advise that passengers who have multiple blocks of rides on their "smart-card" begin requesting "Meida B'Cartis" as often as possible. And if something is not right, question it immediately. And if the driver doesn't or won't give you a satisfactory resolution to your question, do not hesitate to take it to the Superbus office in Mercaz Beit Shemesh. Is Birkat HaChama out of proportion?